Epiphytic plant with short stem completely enclosed by imbricating leaf-sheaths. Many leaves, from 5 to 7, ovate to elliptic, obtuse with well marked central nervure at the lower face of the limb, long from 8,5 to 14 cm, broad from 3 to 6 cm. Flower stalk green, shorter than the foliage carrying few flowers (2/3). Bracts small, of 0,4 mm. Elliptic dorsal sepal with apex dorsaly ducted and acuminate. Lateral sepals concave, elliptic-ovate, with mucronate and acuminate apex, dorsaly ducted, broader than the dorsal sepal. Petals twice longer than broad, ovate, a little shorter than the sepals and as broad as the lateral sepals, with non acuminate mucronate apex. 3-lobed lip almost as long as the petals. Sub-acuminate lateral lobes incrassate toward center. 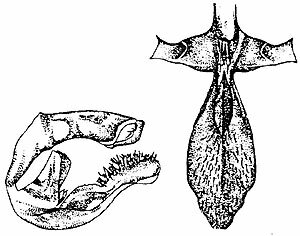 Strongly ducted midlobe over all its length, provided at its base with two callus bifides superimposed. The superior longer than the inferior, finishing above the peak of the midlobe. The hull is hairy on its former half. Column lightly arching from 6 to 8 mm with more larger foot. The cap covering the pollinies is prominent and in shape of Greek helmet. Flowers very round of cream color with a very light suffusion of yellow. The base of the lateral sepals is decorated of some transverse bars (7 to 11), of very clearly brown, fines and almost invisible to the naked eyes. The petals and the dorsal sepal are without spots. The midlobe is pinkish, the lateral lobes yellow . Flowering occurs in spring and in summer. In nature, one finds this species at an altitude ranging between 300 and 500 meters, on trees located close to water falls or growing in frequently flooded zones, in the shade. 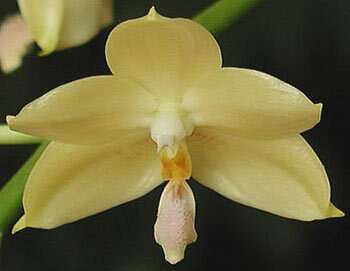 Phalaenopsis floresensis is rather similar to Phalaenopsis amboinensis. It is characterized by its lower size, the absence of well marked transverse bands and especially by the hull of the midlobe which is double for Phalaenopsis amboinensis, and simple for Phalaenopsis floresensis. 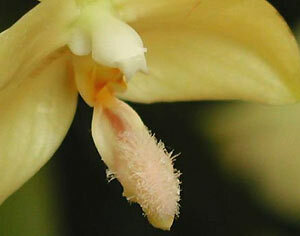 It is also distinguished from Phalaenopsis javanica by the apex of the lateral lobes bifides for this last. The first flowering in culture took place in Arboretum of Los Angeles in May 1990.